video link: Acts of Erasure nº1 / video link: Acts of Erasure nº2 / Documentation Installation. 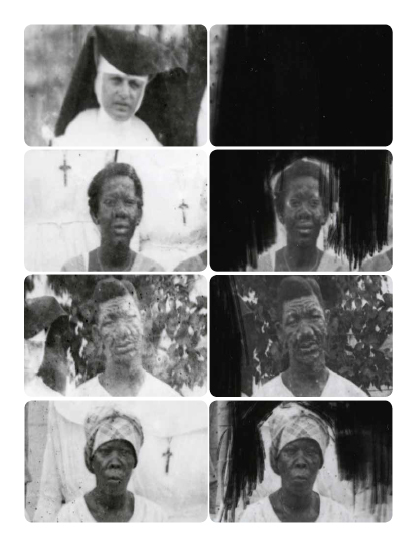 Among the images of the Virgin Islands located in the National Archive in College Park, Maryland, were two images taken in rapid succession at a leprosarium on St. Croix. Although lepers are known to have lived in St. Croix in the eighteenth- and nineteenth-centuries, no movement was made to segregate them prior to 1907. This leprosarium, the second on St. Croix, was located about a mile from Christiansted. Because these two photos were taken in quick succession, animating them brings the subjects to life. This is significant because diseases like leprosy, which require isolation, can be perceived as a form of social death, because it forces a severance of social ties. Animating the individuals shows their vitality, their liveliness, even within the context of isolation and illness. Although the same individuals are in both photos, someone erased the nuns from one of the images. Animating the images emphasizes the contrast between those who remain and those who are erased. Erasing the nuns was a means of erasing the power they held over the individuals in their care. It is an inversion of the expected way of things—the ill endure and persist beyond their caregivers. They live. They remain. This project make part of the Transfer Project. The Transfer Project is a multidisciplinary collective project that attempts to evoke critical thinking about the processes of migration in the islands and encourage people to explore the history and the present nature of migration in the Virgin Islands. A central focus of the project is the transfer of the islands from the Danish to the United States in 1917.